Just when you thought your TV wasn't big enough, Sony has only gone and unveiled a humongous TV that is bigger than a double decker bus. Standing at 63 feet wide and 17 feet high (or 19.3 metres by 5.4 metres), the TV is taller than most single-floor homes. The TV also comes with an impressive 16K resolution, which is 16 times as many pixels a 4K UHD TV (considered top of the range today) and 64 times as many pixels as traditional 1080p HD TVs. This is not the first time Sony has created a 16K display. 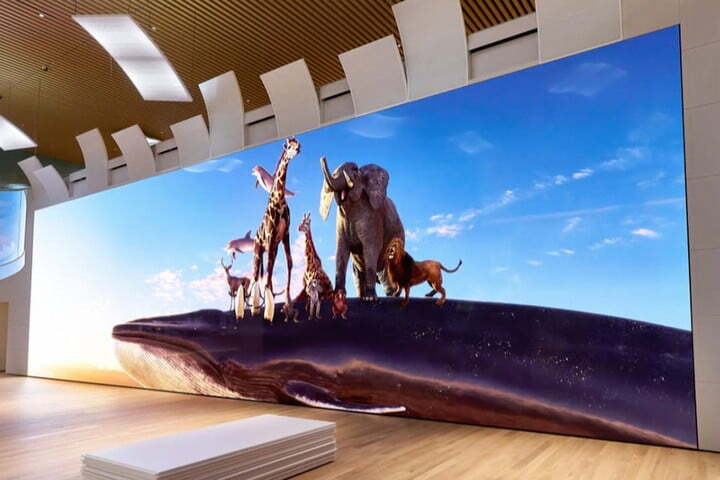 However, the last time this happened, it required multiple displays to be pieced together, The new one at Shiseido Global Innovation Center in Yokohama is entirely a single colossal piece. The new TV was announced at the National Association of Broadcasters (NAB) trade show, which was held in Las Vegas earlier this week. Sony is calling the technology "Crystal LED", which is its brand name for micro-LED display tech. Speaking to the BBC, David Mercer from the consultancy Strategy Analytics said, "we're moving slowly towards 8K TVs at the end of the decade and who knows how long it will take to get beyond that, so 16K is likely to be limited to the corporate world for the time being. But there's no doubt about it. These displays are incredibly impressive in person - even 8K on a big display is almost mesmerising. When you get to this resolution it delivers almost a quasi-virtual reality experience as your eyes perceive there to be depth to the content."